Rebar is a San Francisco-based design and ecology studio with a special emphasis on installations and temporary interventions in public spaces. Founded in 2004, Rebar Studio's self-described specialty is "design operating at the intersection of art, design and ecology." 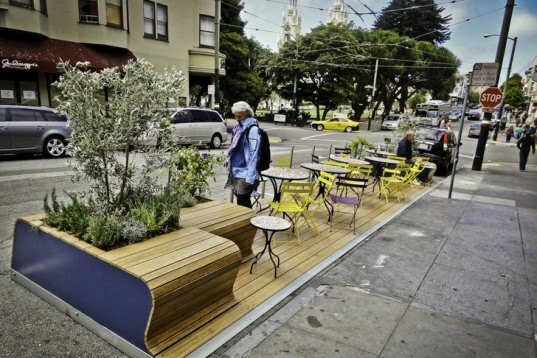 With many successful projects behind them, including a collaboration with the city of San Francisco on the growing "parklet" program, Rebar is poised to make the city of San Francisco a better place to work, live and play. 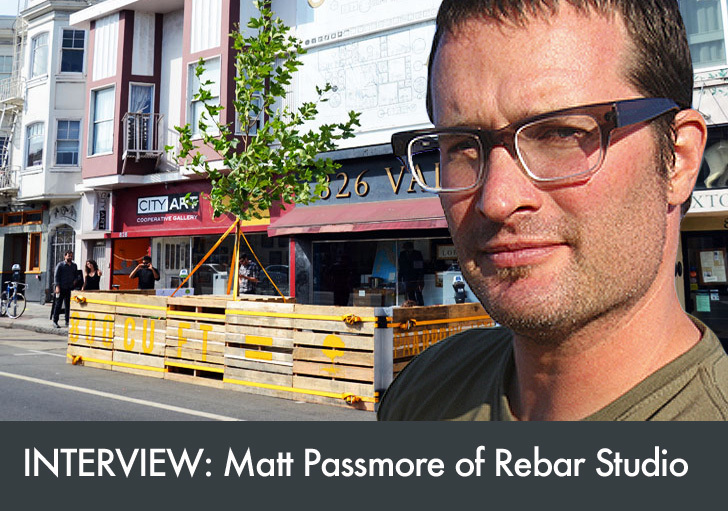 Inhabitat sat down with Rebar co-founder Matthew Passmore (who started the company with John Bela and Blaine Merker) to discuss the group's recent work and what they have in store for the coming year. INHABITAT: How did Rebar get its start? MATT: Rebar started around a project called the Cabinet National Library. We were inspired by an art magazine in Brooklyn called Cabinet, which had bought a piece of land in New Mexico on eBay and invited cultural events and installations to occur on the land. I actually to them a “National Library,” which would be a file cabinet in an earthen berm that would house all the back issues of their magazine. They thought that was great and hilarious. At the time, one of my friends, John Bela, was in graduate school studying landscape architecture, and we started talking about this project. We eventually developed a plan, and we built it in 2004. Following that very fruitful collaboration, we decided to create an organization, call ourselves Rebar, and pursue more projects. The second project was “PARK(ing),” which evolved into Park(ing) Day. Once that project blew up, there were so many opportunities, and so much interest in our work, that we really needed to form an organization and develop ourselves creatively. INHABITAT: What can you tell me about the inspiration behind Park(ing) Day, and how is Rebar staying involved as the project grows? MATT: We first did [PARK(ing) Day] on Mission Street, here in San Francisco. It started with occupying one parking space for two hours, which was the term of the lease offered on the face of the parking meter. INHABITAT: So it was technically legal? MATT: Yes, which was important, as we wanted to be operating within this legal loophole, within the confines of the law, to repurpose this space for a creative use. INHABITAT: How did Park(ing) Day grow, and what inspired you to do it again the next year? MATT: We did next to no outreach prior to the creation of the project, but afterwards, we had some really great images and videos, which we sent out to people and the project gained traction on some blogs. Then it started to go viral and the whole “PARK(ing) Day” project blossomed out of that. People started asking us to come and replicate the project in their city. It really only cost a couple hundred dollars and took a few emails and meetings to create, so we made a decision to make it an “open source” project. We created a how-to manual we could send out to people and say “do it yourselves” and just asked them to give us credit for the idea and not to use it for a commercial purpose. Other than those restrictions, people are free to adapt and remix and remake the project however they will. Other PARK(ing) projects sort of started trickling in between 2005 and 2006. There was a park in L.A., one in Scotland, one in Italy, and as the year went on, we thought: “ . . . we should really organize this! 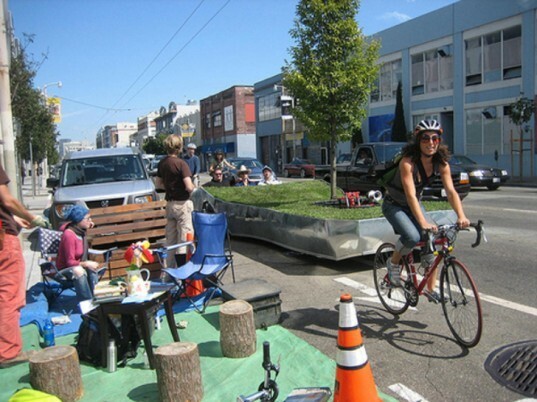 We should focus all of this interest on a single day, to make a much bigger statement about the use of public space.” So in 2006, Park(ing) Day was born. For Park(ing) Day 2011, there were some interesting and far-flung cities participating– including Beijing and Tehran. There were also a few examples of people being shut down by the police, which is actually quite uncommon. But we invite people to leave the street cleaner than they found it – sweep the entire block, not just clean up their installation but take pride in their city. We haven’t calculated this year’s numbers yet, the stories are still trickling in from around the globe, but we anticipate it will be at least as big as last year and probably quite a bit bigger. INHABITAT: One Rebar design that will be familiar to many San Franciscans are “parklets” – tiny urban parks and seating areas created from one or two curbside parking spaces. How are you collaborating with the city and business owners to create these? 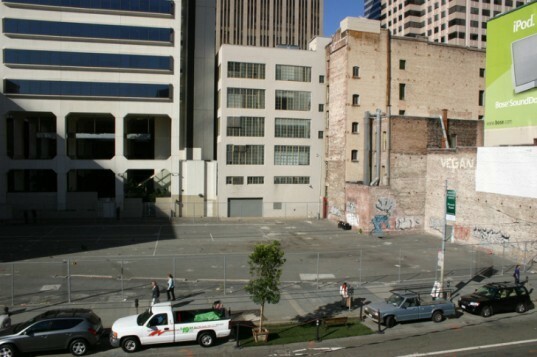 MATT: One of the main reactions of the City of San Francisco to “Park(ing) Day” was to develop a permit process to allow businesses, community groups, and individuals to convert a parking space into a public plaza. We worked very closely with the city to develop the pilot project and build a parklet on 22nd Street, but now it’s an open permit process and anyone can apply. We’ve built about a half dozen so far, and several more are on the docket. People come to us [for design and building] because we have a real sensitivity to the needs of the business and community groups and how to balance those interests with the public interest in having a successful public space. The City just approved a couple dozen [new parklets]. This year on PARK(ing) Day I rode my bike down Valencia Street to survey the installations and I saw: “Parklet, Parklet, Parklet, Parking Day installation, Parklet…” There were very many more parklets than Park(ing) Day installations! So in a sense, our job in a city like San Francisco is done. Park(ing) Day is becoming less relevant, because the city itself now has a program to convert metered parking spaces. It’s quite gratifying to see something like Park(ing) Day influence the city in such a direct way. INHABITAT: How do you work with the public sector, since the work you do is a little bit different than other design studios? As a studio involved in public and urban spaces, how does community involvement play into your project designs? MATT: Our work is deeply engaged in public space and concerned with the quality and variety of public space. We promote public participation as an important aspect of improving public space. When you work on projects like such as these, by definition, your partners are city agencies, government agencies, nonprofits, advocacy groups, and so forth. INHABITAT: Have you found that to be challenging? MATT: We have a great relationship with the City. They often move projects along more slowly than the private sector, which can occasionally be frustrating, but we’ve found that in San Francisco and many other cities, there are a lot of people in bureaucracy who understand contemporary urban issues and are working diligently and creatively to make cities better. They’re surprisingly open and interested in temporary interventions and guerilla tactics and community-based design as ways to achieve strategic planning objectives. INHABITAT: Rebar touts itself as a design studio “operating at the intersection of art, design and ecology.” What role does environmental sustainability play in your designs? MATT: We’re looking at playful ways to provoke a conversation around public space — particularly how the current set of conditions is not a sustainable use of space in the city. When you look at how much urban space is used exclusively or predominantly by the automobile, you are looking at a planning strategy that is outdated, outmoded, and does not adequately express contemporary values. INHABITAT: What can you tell us about upcoming Rebar projects? MATT: We just got back from Sydney [Australia]. The project we showed there is called “BubbleWare” and it’s essentially a set of yoga balls sheathed in oversize nylon bags. We collaborated with Timbuk2, with whom we share a building, who offered their materials and sewing expertise to help make them. 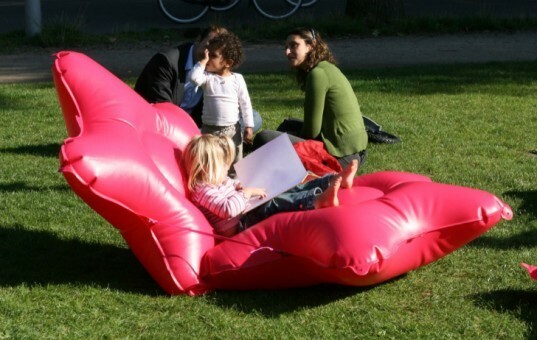 They look sort of like molecules, and are basically oversized inflatable public furniture. We’re hoping to bring those out in public in San Francisco and other parts of the country, to enliven underused public spaces and promote conversation around how ordinary citizens can participate in improving public space. They’re rapidly deployable, they’re fun and they’re inflatable, so they’re sort of the opposite of your average urban materials., They’re soft, they’re nonlinear and they’re colorful. We deployed them in an alleyway in Syndey and provoked a range of reactions, from studied ignorance to uninhibited engagement. But either way, they cause people to think more expansively, even if just for a moment, about the range of possibilities for urban public space. INHABITAT: So can we look forward to seeing those around San Francisco soon? INHABITAT: How did Rebar get its start? MATT: Rebar started around a project called the Cabinet National Library. We were inspired by an art magazine in Brooklyn called Cabinet, which had bought a piece of land in New Mexico on eBay and invited cultural events and installations to occur on the land. I actually to them a “National Library,” which would be a file cabinet in an earthen berm that would house all the back issues of their magazine. They thought that was great and hilarious. At the time, one of my friends, John Bela, was in graduate school studying landscape architecture, and we started talking about this project. We eventually developed a plan, and we built it in 2004. Following that very fruitful collaboration, we decided to create an organization, call ourselves Rebar, and pursue more projects. The second project was “PARK(ing),” which evolved into Park(ing) Day. Once that project blew up, there were so many opportunities, and so much interest in our work, that we really needed to form an organization and develop ourselves creatively. INHABITAT: What can you tell me about the inspiration behind Park(ing) Day, and how is Rebar staying involved as the project grows? MATT: We first did [PARK(ing) Day] on Mission Street, here in San Francisco. It started with occupying one parking space for two hours, which was the term of the lease offered on the face of the parking meter. INHABITAT: So it was technically legal? MATT: Yes, which was important, as we wanted to be operating within this legal loophole, within the confines of the law, to repurpose this space for a creative use. INHABITAT: How did Park(ing) Day grow, and what inspired you to do it again the next year? MATT: We did next to no outreach prior to the creation of the project, but afterwards, we had some really great images and videos, which we sent out to people and the project gained traction on some blogs. Then it started to go viral and the whole “PARK(ing) Day” project blossomed out of that. People started asking us to come and replicate the project in their city. It really only cost a couple hundred dollars and took a few emails and meetings to create, so we made a decision to make it an “open source” project. We created a how-to manual we could send out to people and say “do it yourselves” and just asked them to give us credit for the idea and not to use it for a commercial purpose. Other than those restrictions, people are free to adapt and remix and remake the project however they will. Other PARK(ing) projects sort of started trickling in between 2005 and 2006. There was a park in L.A., one in Scotland, one in Italy, and as the year went on, we thought: “ . . . we should really organize this! We should focus all of this interest on a single day, to make a much bigger statement about the use of public space.” So in 2006, Park(ing) Day was born. For Park(ing) Day 2011, there were some interesting and far-flung cities participating– including Beijing and Tehran. There were also a few examples of people being shut down by the police, which is actually quite uncommon. But we invite people to leave the street cleaner than they found it - sweep the entire block, not just clean up their installation but take pride in their city. We haven’t calculated this year’s numbers yet, the stories are still trickling in from around the globe, but we anticipate it will be at least as big as last year and probably quite a bit bigger. INHABITAT: One Rebar design that will be familiar to many San Franciscans are "parklets” - tiny urban parks and seating areas created from one or two curbside parking spaces. How are you collaborating with the city and business owners to create these? MATT: One of the main reactions of the City of San Francisco to "Park(ing) Day" was to develop a permit process to allow businesses, community groups, and individuals to convert a parking space into a public plaza. We worked very closely with the city to develop the pilot project and build a parklet on 22nd Street, but now it’s an open permit process and anyone can apply. We’ve built about a half dozen so far, and several more are on the docket. People come to us [for design and building] because we have a real sensitivity to the needs of the business and community groups and how to balance those interests with the public interest in having a successful public space. The City just approved a couple dozen [new parklets]. This year on PARK(ing) Day I rode my bike down Valencia Street to survey the installations and I saw: “Parklet, Parklet, Parklet, Parking Day installation, Parklet…” There were very many more parklets than Park(ing) Day installations! So in a sense, our job in a city like San Francisco is done. Park(ing) Day is becoming less relevant, because the city itself now has a program to convert metered parking spaces. It’s quite gratifying to see something like Park(ing) Day influence the city in such a direct way. INHABITAT: Rebar touts itself as a design studio “operating at the intersection of art, design and ecology.” What role does environmental sustainability play in your designs? MATT: We’re looking at playful ways to provoke a conversation around public space -- particularly how the current set of conditions is not a sustainable use of space in the city. When you look at how much urban space is used exclusively or predominantly by the automobile, you are looking at a planning strategy that is outdated, outmoded, and does not adequately express contemporary values. Rebar worked with community residents to transform this vacant lot into the Growing Home Community Garden. INHABITAT: How do you work with the public sector, since the work you do is a little bit different than other design studios? As a studio involved in public and urban spaces, how does community involvement play into your project designs? MATT: Our work is deeply engaged in public space and concerned with the quality and variety of public space. We promote public participation as an important aspect of improving public space. When you work on projects like such as these, by definition, your partners are city agencies, government agencies, nonprofits, advocacy groups, and so forth. INHABITAT: Have you found working with the public sector to be challenging? MATT: We have a great relationship with the City. They often move projects along more slowly than the private sector, which can occasionally be frustrating, but we’ve found that in San Francisco and many other cities, there are a lot of people in bureaucracy who understand contemporary urban issues and are working diligently and creatively to make cities better. They’re surprisingly open and interested in temporary interventions and guerilla tactics and community-based design as ways to achieve strategic planning objectives. The "Cabinet National Library" houses a file cabinet full of back issues of Cabinet Magazine in a small landholding in rural New Mexico. INHABITAT: What can you tell us about upcoming Rebar projects? MATT: We just got back from Sydney [Australia]. The project we showed there is called “BubbleWare” and it’s essentially a set of yoga balls sheathed in oversize nylon bags. We collaborated with Timbuk2, with whom we share a building, who offered their materials and sewing expertise to help make them. 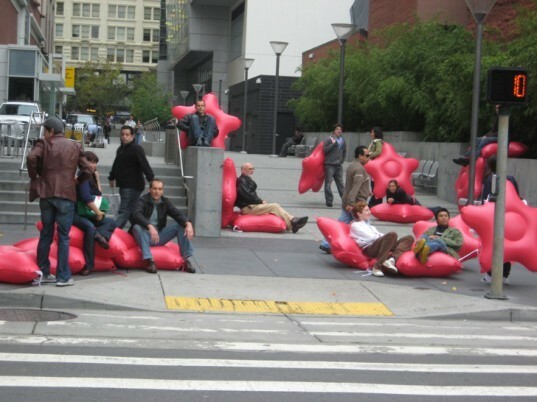 They look sort of like molecules, and are basically oversized inflatable public furniture. We’re hoping to bring those out in public in San Francisco and other parts of the country, to enliven underused public spaces and promote conversation around how ordinary citizens can participate in improving public space. They’re rapidly deployable, they’re fun and they’re inflatable, so they’re sort of the opposite of your average urban materials., They’re soft, they’re nonlinear and they’re colorful. We deployed them in an alleyway in Syndey and provoked a range of reactions, from studied ignorance to uninhibited engagement. But either way, they cause people to think more expansively, even if just for a moment, about the range of possibilities for urban public space. INHABITAT: So can we look forward to seeing those around San Francisco soon? MATT: Yes, definitely. Rebar's concept drawing for housing modules for the urban goats that make up City Grazing's team of living lawnmowers. Public art in the works, Rebar is currently working on "Gigantry", a piece of sculpture that echoes the shipbuilding past of San Francisco's Bayview neighborhood.